I’ve also been collecting a delicious list of food, food and more food to eat while we’re away. The list is so long that, at this rate, I don’t think we’ll even get time to see the Taj Mahal! 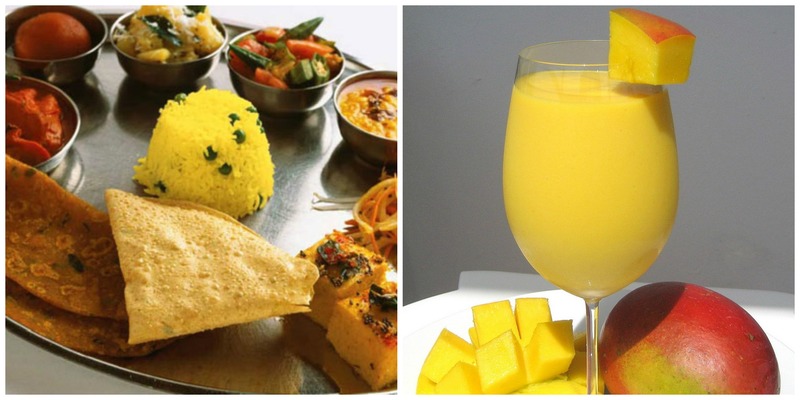 Foods such as thali and dosas have been making me dribble since reading about them, and drinks like chai and lassi sound oh so good. But I am really looking forward to having a completely different Christmas away from home, just me and Alex. I’ve tried to make it as different as possible from our normal Christmas, by timing it so that we will wake up in the middle of the Thar Desert on Christmas Day. This, at least, will make it a Christmas to remember. Between all the travel planning, I have managed to squeeze in a couple of fun adventures in London though. 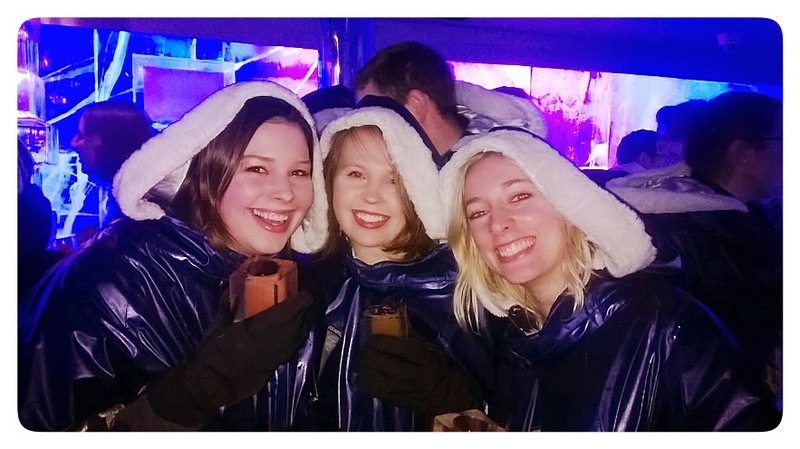 A couple of weeks ago I was lucky enough to be invited to a Lapland in London event at Ice Bar sponsored by Cosmos. Not only was the Ice Bar somewhere I had wanted to go for a while, but I also love Lapland and it’s one of my favourite family holidays from when I was younger. Okay, I wasn’t that young, I was a teenager, but if you go to Lapland, it’s pretty much the law that you HAVE to sit on Santa’s knee however old you are! Because this was a blogger event we were treated to free drinks all night and I have to say that the Northern Light cocktail was chilled to perfection and fitted right in with the theme of the evening. 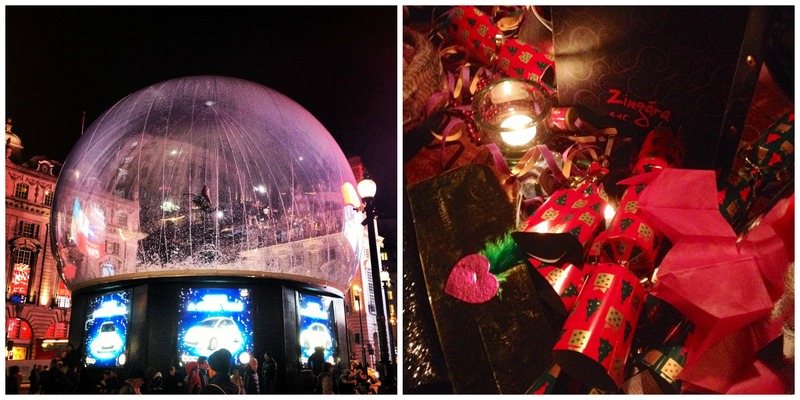 We started off with a bit of fun – some ice sculpting! In a team with Kasha of Lines of Escape and Jess of The Fly Away American, we attempted to recreate a polar bear, the original of which received the obligatory oohs and ahhs. Kasha and I took a more gentle approach, while Jess hacked away at our polar bear (losing us a big chunk of its behind in the process!) 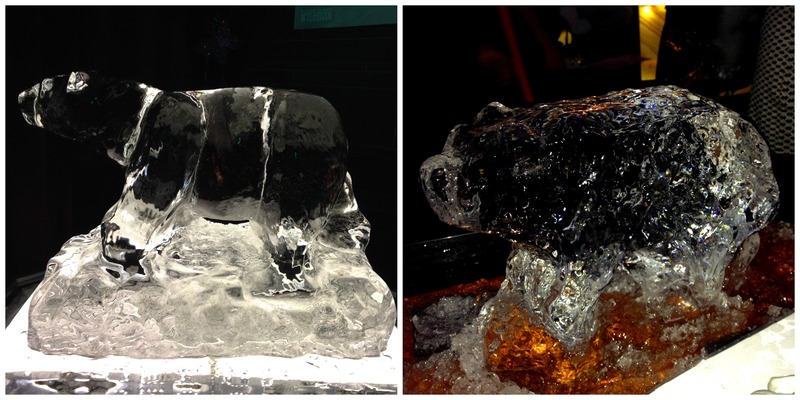 and we ended up with something that looked less like a polar bear and more like…erm…a jagged lump of ice. 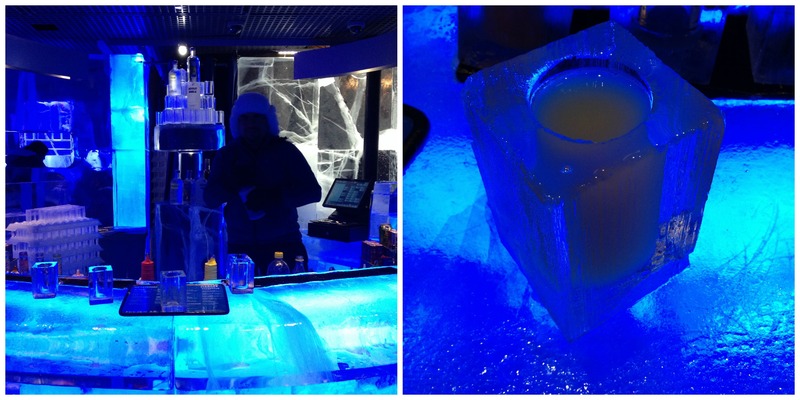 We then donned our Little Blue Riding Hood-esk cloaks and thick gloves and made our way into the -5°C Ice Bar where the walls, bar, tables and even your glasses are all made from ice straight out of Sweden. Despite the cosy gloves, my fingers started to get a bit numb towards the end and my glass starting melting where I kept taking sips from it! So the 40 minute time slot you get inside is perfectly enough! I also managed to squeeze in a catch up with Kasha this week. Despite me being born in London and living here my whole life, I left the choosing of the venue down to Kasha, even though she has only lived in London for the last year, as she seems to find some great little spots. And this one was definitely a good find. 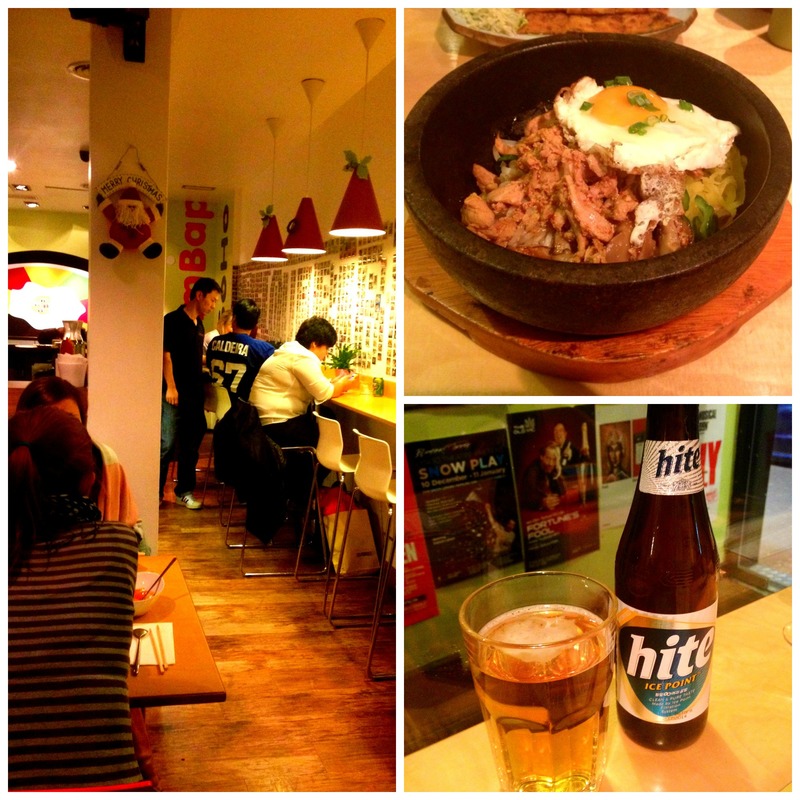 Bibimbap, a South Korean café style restaurant in Soho, which proved to be very popular from the queue that was waiting outside before the place even opened. Neither of us had ever tried Korean food but it was surprisingly tasty and has left me wanting to go back again. Adventures aside, trying not to get into the Christmas spirit is proving to be very difficult when the streets are filled with bright twinkly lights and a giant snow globe in London’s Piccadilly, work, friend’s houses and restaurants are full of decorations and Christmas songs are on repeat in every shop I go into. But even though I won’t really get a traditional English Christmas this year, I know that it will be one I will never forget. 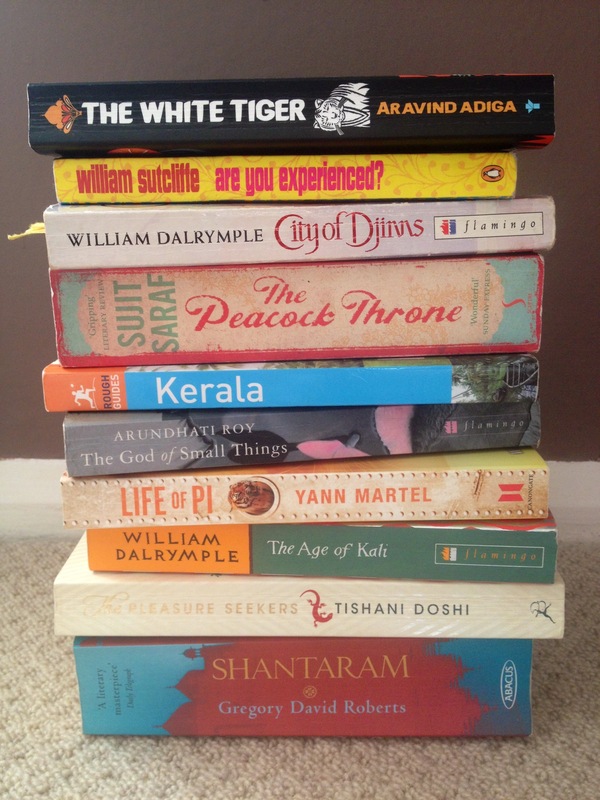 Have you read Shantaram yet? It might make you not want to go! Haha. But really, I’d love to go to India! Have fun! Thank you Jess. Really looking forward to Christmas away will just be very strange being in a hot country without my family but I’m sure it will be special still! Thank you for meeting up with me this week! I’m still daydreaming about the food from Bibimbap. We must do another foodie adventure when you come back. Muchos hugs to you, my lovely! Yes, it will definitely be a Christmas to remember! You are going to have one of the best Christmases in your life Ayla! Wow, it’s going to be incredible! I’m in China for this festive period and although there are plenty of Christmas trees and decorations it just doesn’t feel like Christmas at all. My last couple have been super festive by going to Switzerland just beforehand, the snow, the markets, the Glühwein … ah so festive! But when it gets to Xmas day, and you do whatever you can to feel Christmassy then it will be amazing! We are meeting up with some travel friends in south china so we can have a travel-family Christmas day, it’s going to be so much fun! Hi ayla, I can identify with your upcoming Christmas experience away from home. 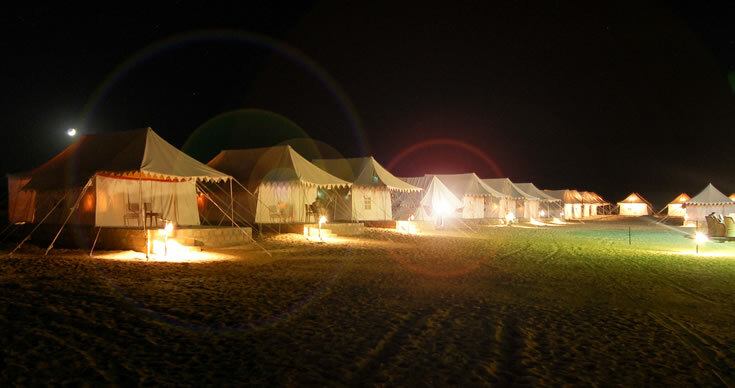 We’ll be in rajasthan too though in Udaipur over Christmas. We’re currently in jaipur and loving our 5 week tour of India. It’s amazing, fascinating and humbling at times. The people have been really kind and the food is fantastic. I’ll follow along with your adventures on Twitter! You can find me too if you like: @cre8ivetravelr enjoy your trip!